The weather is finally finding its way back up into positive territory, and after several days in the house, here are a few things you can do this weekend to get back out and enjoy Albuquerque. There are still performances of Wicked playing at Popejoy Hall, and the fun Sherlock Holmes: The Final Adventure wraps up this weekend at Albuquerque Little Theater. And Albuquerque On Stage is in full swing through next weekend, showcasing a wide variety of live stage performances throughout the city. The Albuquerque Thunderbirds are at home this weekend, taking on the Rio Grande Vipers at 7:30 tonight. Two nimble-fingered APPCityLife iPhone app users scored a four-pack of seats by being the first to enter an instant giveaway from coach Darvin Ham. Be on the lookout for messages that pop up in the app – it may just be free tickets or discounts for our users. Oh, and in case you hadn’t heard, there a big football game on TV on Sunday. Aileen O’Catherine has a great list of local sports bars if you’re looking for a venue to watch the game with your friends. And be sure to enter the Ad Bowl to vote on your favorite commercials; it’s the brainchild of local ad agency McKee Wallwork Cleveland. And you have just a few days left to get your entry in for both our in-app (just touch the heart on the landing page) and Facebook giveaways (scroll down the page to find the post). 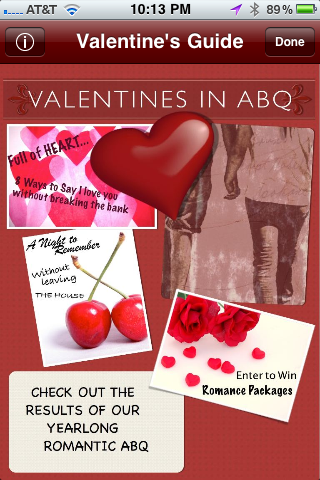 Clarion Hotels, O’Neill’s Pub, Alpine Lodge in Red River, Neilmarie Salon.Spa.Gallery, and NMSO have all brought together a sweet set of free ways to celebrate Valentines, and KISS Coffee is offering one very low price for the Valentines Brunch in Old Town. This entry was posted in Event Recommendations and tagged ABQCityLife, Ad Bowl, Albuquerque, APPCityLife, City of Albuquerque, Events, McKee Wallwork Cleveland, New Mexico, New Mexico Thunderbirds, Santa Ana Star Center, sports bar, Superbowl, Valentine's Day. Bookmark the permalink.